**** Potential Spoiler Alert- I may be sharing some parts of the "Wonder" movie in this review. Please stop reading now if you'd like to avoid any spoilers. 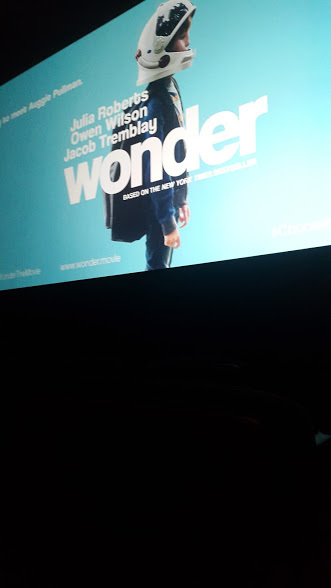 D and I attended an advance screening of Wonder this past Tuesday. Aside from a little trouble finding the theater, it was a great experience. We would definitely recommend seeing the movie and I feel like we actually might go again with Matt and R.
Neither D or I have read the book. I am kicking myself for not grabbing a copy when I worked at the book fair in September. Despite not reading it, we were familiar with the story before we even knew about the movie, and as soon as she saw a commercial, D was asking to see it. I knew then, she would end up being my "date" to the screening. Now, as I've mentioned in a previous post, I was a bit teary watching the commercials, so I went in to the theater with packs of tissues. I did end up needing them, just not for the scenes I had assumed I would. I really don't like crying in front of others, but based on what I was hearing all around me, I wasn't the only one and the theater was dark enough, so it all worked out okay. D, who is pretty sensitive, did not cry. I think it's a great idea for parents to bring their children to see this movie, I would just suggest bringing lots of tissues. Also, if you are like me and eat when you are sad, be sure to grab your favorite comfort snacks from the concession stand! Milestones or transitions: Parents who are getting ready for milestones or transitions with their own children (D is turning 10 this weekend and it's her last year at elementary school) may become a little more emotional during this film than other parents. I have never loved Julia Roberts or Owen Wilson in a role more than I love them as Auggie's and Via's parents. I am literally getting a little teary right now just thinking about it as I type this up. Bullying: I was expecting to see some bullying, but not to the extent it was portrayed in the film. My heart broke for kids that deal with this. If you or your child has dealt with bullying, there are scenes that may hit a little too close to home for you. A-hole parents: I don't know that there is much more I need to say. I am just glad that I don't have to deal with these types of parents in my daily life, but I know they are out there. There is one scene in particular that made my skin crawl. We think you should go see this movie. Whether or not you have read the book, you will get drawn in. The story, which is not only about August (Auggie) and his experiences, but the experiences of those around him as well, will captivate you. Such an amazing job was done in making the movie's characters (even the especially unpleasant ones) more than just one dimensional figures. 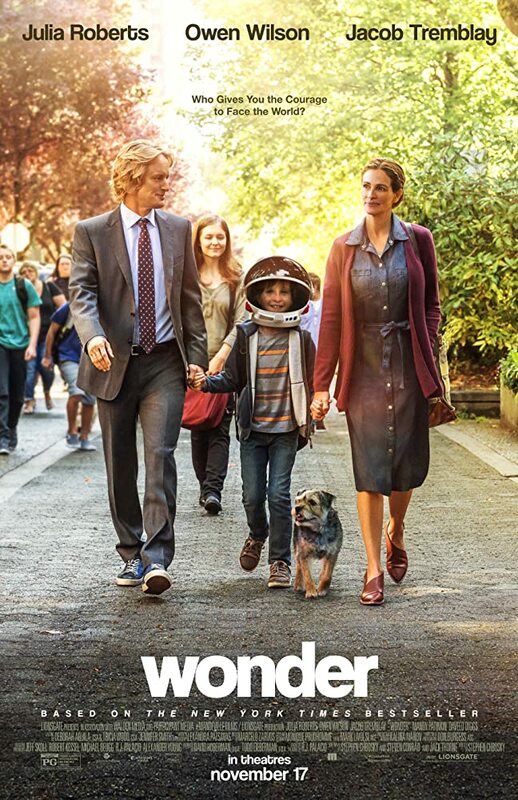 You can find out more about Wonder (and get your tickets) on the movie's website. Be sure to go ahead and check Wonder out on Facebook, Instagram, and Twitter too! so glad to see a nice family movie out!